The final match arrived and the low numbers would be my home for the day, after another excellent Millfield café brekkie we all headed out to Perry St to do the draw with the guys at Sadborow going first where the top three would battle it out for the title. 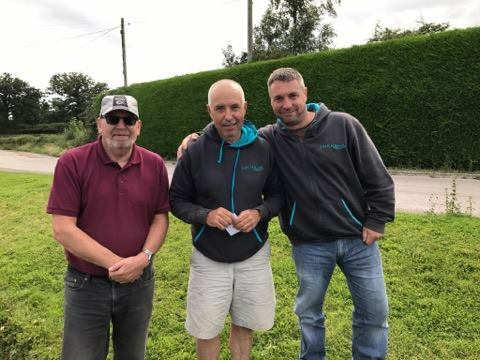 Howard was on peg 1 with Shane on 5 and Exeter Mike on 9, all decent pegs and anything could happen although Howard did have a three point cushion. Then it was the turn of Perry Low to draw and I just wanted to avoid peg 1 which hasn’t been great so I had a master plan and would let everybody go first and I’d have the last peg in the bucket. Of course you know what’s coming next and I was left with the peg I didn’t want. 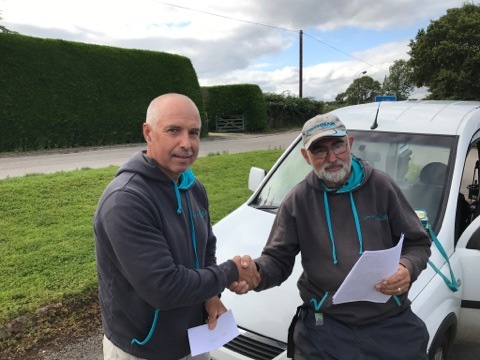 As it turned out the last two pegs in the bucket were 1 and 10 with Commander Smith the lucky recipient of the latter. I took my kit to the peg and to be honest it looked nice although while I was setting up I only saw a couple of carp cruising about. The usual rigs were assembled, an in-line dibber for fishing a shallow, a 0.3 gram Drennan Crystal Margin for the inside line and I made up a new rig for the five metre meat line. 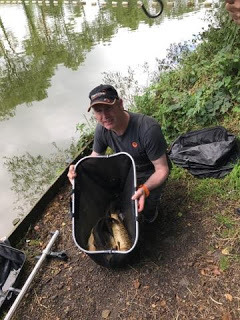 On the side tray today I had Bait-Tech 6mm and 8mm Carp and Coarse Pellets, Strawberry Meat, maggots and some Juice Dumbells in case I could see the odd cruiser. I was ready in plenty of time so wandered up to give the Tart some abuse, as I reached him on peg 7, Superintendent Smith was already there and there were loads of carp swimming about which didn’t bode well as far as my pound was concerned and with Picky on peg 4 and Janders on 8 at Sadborow, this could be an expensive day! 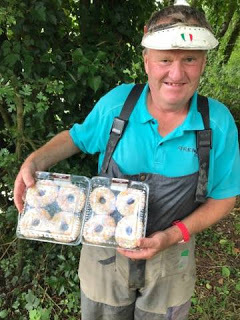 On the plus side, Sergeant (Delia) Smith had brought some lovely looking doughnuts for today’s treat. I walked back with a few minutes to spare and on the whistle I cupped in some meat at 5 metres and dead reds and some meat on the inside before starting at 11.5 metres with the shallow rig and a banded 6mm pellet. After a couple of minutes of firing 6mm’s out and lifting and dropping the rig, I was surprised when the float shot under and I was into a carp already. 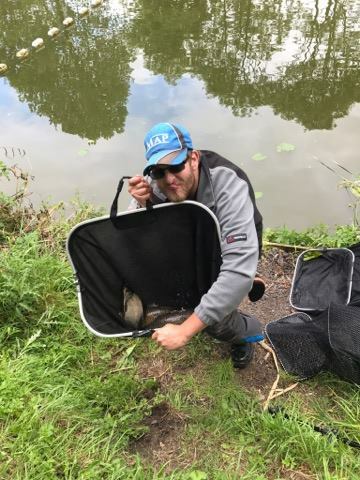 I safely netted a decent fish and was relieved to get off the mark as the last time I was on this peg, I was still blanking after 3.5 hours! The Hoff on peg 2 landed a couple of carp and Grandad Young over on peg 17 had netted one as well. 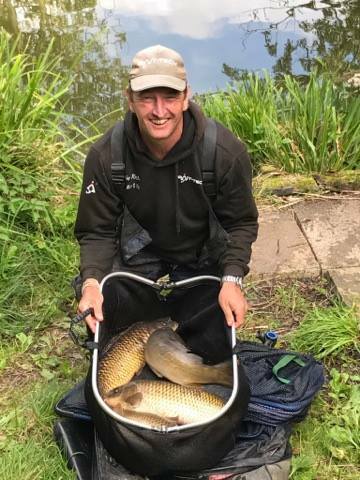 Any thoughts of bagging up soon disappeared when the rest of the first hour was pretty uneventful, I was just about to try the inside line when I had two more carp in quick succession which prompted me to stick at it for another hour. Along with feeding the 5 metre and inside lines, I was also pinging a few 8mm’s up towards the corner where I’d caught a few late the last time. As the second hour drew to a close I hadn’t added to my three fish so I tried the inside line for the first time. 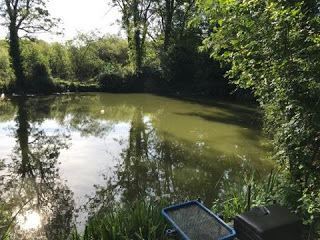 I hadn’t been in there long when the float disappeared at a rate of knots and a decent fish has gone off up towards Hoff, I was hanging on with the pole tip under water when everything’s gone slack and its buried me in some lilies and snapped me. The next bite saw me get the fish in open water only for it to come off and when I looked at the rig, I had a load of line and another hook attached to it, so I think I’d hooked that rather than the fish. 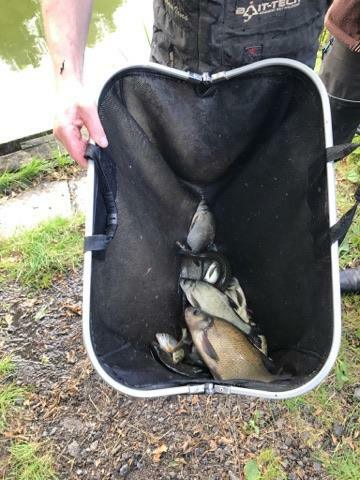 Things got even worse when I lost the next two as well, I got both in open water and the hook has just pulled out, on a day when the bankside grapevine was suggesting it was fishing hard, I had a feeling they might cost me! Yardie over on peg 19 was having the same problem and had several come off for no apparent reason so maybe they weren’t having it properly. Hoffy was a couple of fish ahead of me but I couldn’t tell how the rest of my section was doing although it sounded like Picky and the Tart were getting odd fish. I cupped in some more feed on the inside before having another go shallow without any success and a first look at 5 metres had the same result. A fish signalled it’s presence on the inside with a tail pattern so I quickly shipped back and changed rigs, the float sailed away and I actually managed to get this one out to level the scores with the fish at 4-4! Then normal service was resumed when I hooked another that snagged me and I had to pull for a break. I had another go shallow but it just wasn’t happening so I stuck on another section and went up towards the corner where I’d been feeding 8mm’s for four hours and never had a bite! Another fish waved at me from the inside so I went in to say hello and enjoyed a purple patch, landing three fish quite quickly to make the score 7-5 in my favour and with an hour left, I thought if I could get another couple, I might not be far off. 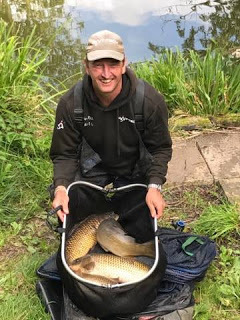 Then my mate Andy turned up for a chat and it was great to see him, he said he’d almost thought about getting his gear out again but after watching me catch nothing for an hour, I’d probably done nothing to inspire him! 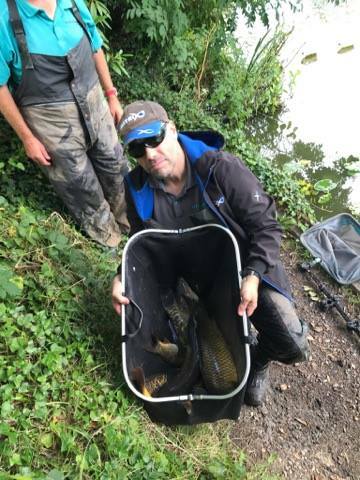 Hoff had a decent fish late to put him on 8 and a skimmer, I packed up and as people started taking their kit back to the cars, I asked how they’d done, it had fished hard for most, Picky had 5, Mark had struggled for a couple on peg 5, Bushy had 7, the Tart had 9 and Sith Lord Smith was admitting to a similar number. The scales started with me and my fish went 30lb 14oz which was an improvement on the last time but could have been a lot better. Hoff weighed 35lb 12oz and that last fish had done me, Picky weighed 15lb 12oz and then Mark had 6lb 14oz before we got to the Tart, his fish went 44lb 2oz although he said he’d lost 15, so obviously a few fish there then! Bushy just pipped me with 31lb 8oz to push me down another place and then we got to Corporal Smith on peg 10, when he pulled his net out, it was obviously going to be close and he’d just done enough to beat his travelling partner with 44lb 8oz so at least he wouldn’t have to put his ear plugs in on the way home! Then we headed around to weigh in the other section, Chilly had struggled in peg 11 to weigh 10lb 6oz, Les had 16lb 12oz which included 9lb 4oz of silvers, Oz on peg 13 had 17lb and then Bish had done well on 14 and weighed 58lb 14oz. 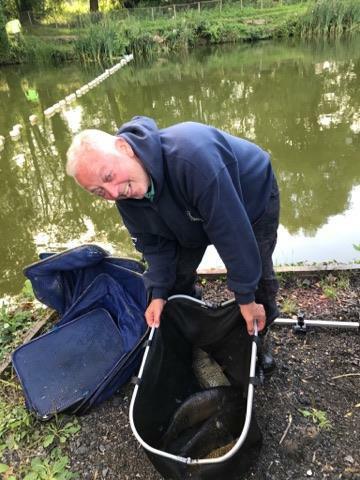 Butch didn’t weigh and then Grandad Young had 39lb 6oz from peg 17 and struck a pose for the camera although we weren’t sure he’d be able to get back up again! That just left Yardie who had 10lb 10oz but had lost several as well. Grandad struck a pose with his 39lb 6oz but we weren’t sure he’d be able to get back up again! 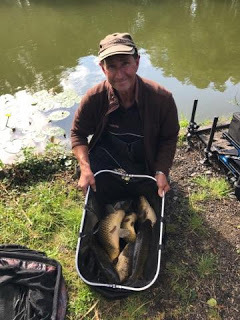 Back at the car park and everybody was back from Sadborow, Howard had finished his league in style with 66lb 12oz to win the section, match and league, well done mate. He lead the league from the second match, winning his section five times along the way. 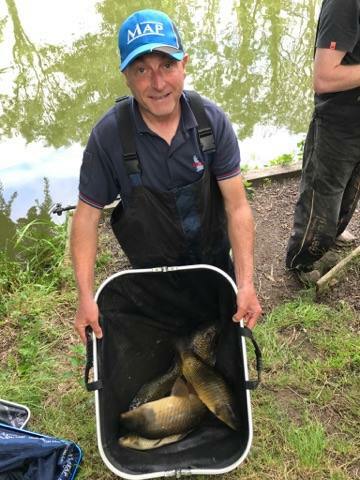 Exeter Mike was second in the section with 57lb 14oz which meant he finished as the runner up in the league ahead of Shane. 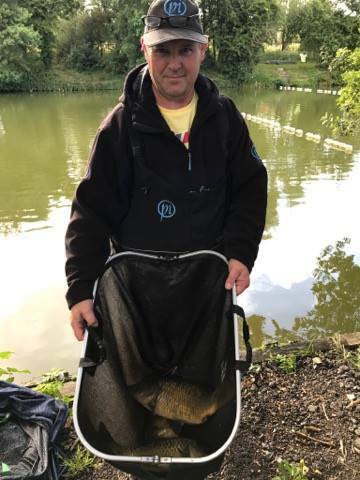 Janders was third on the day and took a pound off me with 52lb. 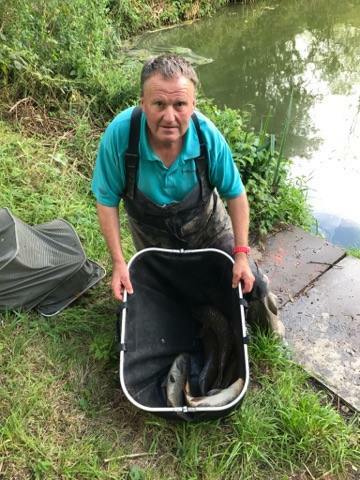 So huge thanks to Les for organising another great league and to all the anglers for making it such a good laugh. But for me (and everybody else, I’m sure) the league will be remembered for the wrong reasons with the sad loss of Dave, tight lines and rest in peace mate.